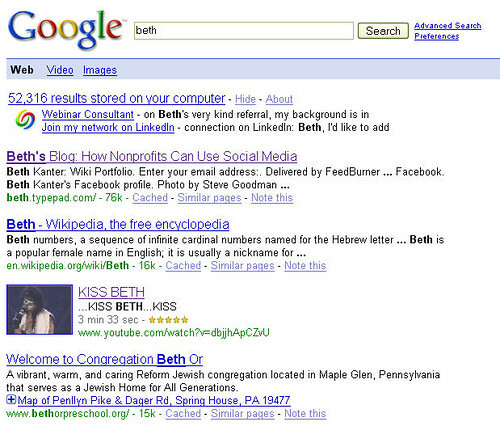 I discovered that if you google the word "Beth" my blog comes up first in the search results - most of the time. Occasionally, the "Beth" entry for wikipedia comes first or Beth Israel Hospital. Today, a youtube video called "Kiss Beth" appeared third. I had no idea why this happens, but in workshops when people ask for my url, it is easy to say "Google Beth" and it gives me a reason to mention the impacts of blogging on search engine results. Today, Holly Ross at NTEN discovered the technical reason from this Wired Magazine illustration. She found the link via Paul Hyland's Facebook profile. 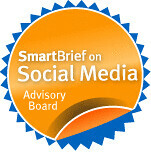 That's a demonstration of some of the value of using a social network - that you get to see what information colleagues are posting - and some of it may have some relevance to your work. That is impressive. When I started online, googling "roger carr" gave me pages of mainly CEO's, a football star and a musician. Today I am in 5 of 10 listings on the 1st page and an even higher number on the next couple of pages. You have given me a new goal. Being able to tell people to "Google Roger."